You've found the “U.S. 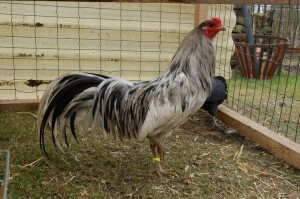 Sumatra Chicken Breeders” page here at Hobby Farm Wisdom! If this is the first time you have visited our site: Welcome! The Sumatra chicken is a breed originating on the island of Sumatra. They were originally used for cockfighting but today are kept primarily ornamental purposes. Sumatra chickens have long curves and very attractive plumage and multiple spurs on each leg. While Sumatra hens will lay an average of 100 white eggs per year, they are more likely to go broody than other breeds. Unlike many modern breeds, Sumatras are strong flyers and the males can get very aggressive during breeding season. The most popular variety is the Black Sumatra, with its long, low tail, green sheen and purple/black face. They are an active and alert breed, making them good at avoiding predators.